The F10 MkIII embodies Pacific’s core design philosophies of safety, quality and comfort. 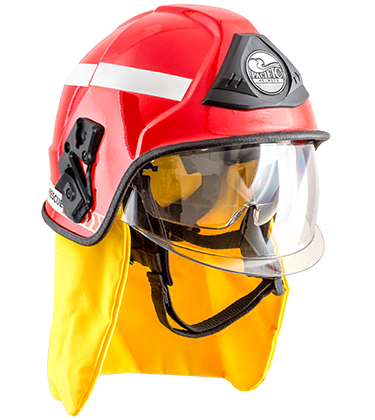 Design features include internal bubble face shield and unique One Touch Eye Protector™ (OTEP). Accentuated shell lines provide improved shock absorption and structural rigidity. The F10 MkIII is certified to AS/NZS4067 and NFPA1971 & NFPA1951. Contact your Pacific Helmets representative for more information and to design your F10 MkIII. Some features may be compulsory depending on the standard selected. Please ask your Pacific Helmets representative for more information on feature compatibilities. High speed particle protection. Heat and flame resistant. Anti-scratch and Antifog coated. Optically correct. Clear and Gold Tint available. (Optional) EOB only version as standard. Easi Glide Torch Holder and torch sold separately. The F10 MkIII is compatible with lighting solutions such as the Underwater Kinetics eLED and Adaro Adalit L5 Torches, and can be fitted with Titan Firecomms with helmet mounted boom microphone and speaker systems. Some accessories may require selected helmet features.